Contact the Furniture Program regarding the purchase, and/or rental of fully adjustable chairs. When workstations go wrong, the first place people typically look is their chair. Providing an ergonomic chair does not benefit the user if the user does not know how to use and adjust the chair. These are the basic guidelines to look for in a suitable office chair. While standing, adjust the height of the chair so the highest point of the seat is just below your kneecap. This should allow your feet to rest firmly on the floor when seated. If you feel pressure near the back of the seat, raise you chair. If you feel pressure near the front of the seat, lower your chair. The goal is to evenly distribute your weight. When sitting, adjust the height of the backrest so the lumbar pad supports the natural curve of your lower back (lumbar curve). The tilt of the back support should allow you to sit with your upper body slightly reclined (110 degrees is usually recommended). Seat tilt can be adjusted to improve your comfort. This will also affect your weight distribution. A tilt of five degrees is usually recommended. 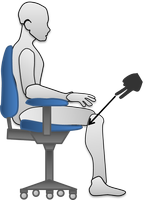 When sitting, the seat pan (part of the chair you sit on) should allow you to use the back support without the front of the seat pressing against the back of your knees. If the seat is too deep, try a back support (lumbar pillow) to reduce the size of the seat pan. Some chairs have adjustable seat pans. The adjustment lever is usually located under the front of the chair, much like the lever that moves the seat forward and backward in a car. The seat pan should be wide enough so it does not apply pressure to your thighs. Conversely, the seat should be narrow enough to be able to reach the armrests when they are properly adjusted. Armrests can provide support for the upper part of your forearms, thereby reducing the stress on your shoulders and back.However, the armrests should not prevent the chair from being drawn close to the desk, nor restrict natural movements. If your armrests cannot be adjusted to allow for this, then consider removing or replacing them. Also keep in mind that soft armrests will minimize contact stresses on your elbows. Gel wraps can be purchased to go over armrests that may be too hard.